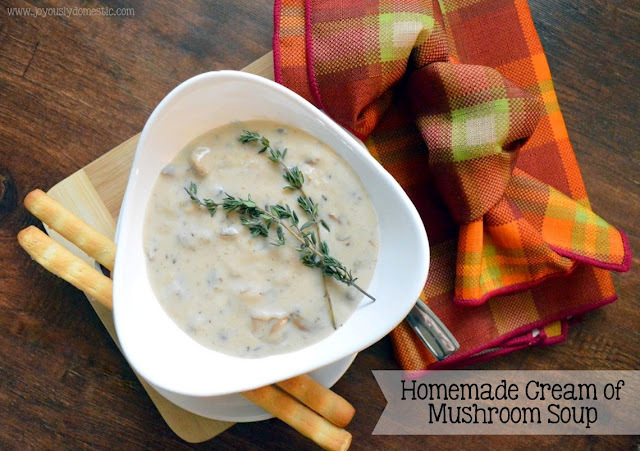 I recently whipped up some homemade cream of mushroom soup for just the hubby and I. The kids had eaten already in town after grocery shopping, but the parental units of the house were starving. This soup comes together in such a short amount of time and I usually keep mushrooms (and the other ingredients for this) on hand. My husband prefers this over buttered toast, but I enjoy it just as soup with some crackers on the side. It can be used as a sauce to serve over chicken, as well. I've used this as a base for cooking cubed steak in the slow cooker, too. I've kind of shared this recipe before within my Savory Meatballs in a Homemade Mushroom Soup Sauce post. But, I wanted to bring it to you today as simply a glorious soup that knocks the canned, store-bought variety out of the park! This soup has such a velvety, rich texture and the mushrooms impart such a deep, earthy flavor. This only makes enough for three servings, so you may want to double the recipe if you're feeding a larger family or just want some leftovers. Preheat the oil and butter in a soup pot over medium heat. Add in the chopped mushrooms. Cook - stirring occasionally - until mushrooms are tender and just starting to brown. Stir to coat mushrooms in flour. Cook a few minutes until the raw flour has a chance to become a bit golden and takes on a nutty smell. Add in the stock/broth while stirring to create a thick gravy. Cook while stirring for about two minutes. Slowly add in 1 1/2 cups of the milk while stirring or whisking. Bring to a simmer. If soup seems too thick, add in the remaining 1/2 cup of milk. Once soup is simmering, you can add in 3 - 4 tablespoons of heavy cream, if desired. This just gives the soup a super velvety texture. Season liberally with black pepper. Taste and add salt, if needed. Turn heat to low until ready to serve. Stir one last time before serving. Serve with fresh thyme leaves for garnish, if desired. I think the photos are quite beautiful :) And looking at them just made me hungry! Hope you're having a great week. Thank you once again for stopping by and always commenting with such sweet words.